When I was a student at Brown University, I used to love to go to the Rhode Island School of Design Museum on Benefit Street. Tucked away on the sixth floor of the RISD galleries was a 10-foot tall wooden sculpture of Dainichi Nyorai, the supreme Buddha of Mahayana Buddhism as taught by the Shingon sect, from the 12th Century. The room where the Buddha was kept could only be described as inexpressibly quiet. Knowing nothing about meditation at the time, I nevertheless found myself inexplicably drawn to sit quietly in the room whenever I visited. It was as if here at last I could actually find peace inside myself, just sitting next to the wooden Buddha. When I returned to Providence in 2013 to visit, I naturally wanted to visit my old friend. I was disappointed to discover the Dainichi Nyorai Buddha is being restored and was unavailable to share his peace. You can read more about the project to restore him at this link. I look back at the glimpse I received at that time some 37 years ago of the future benefits I would receive from meditation. It was as if the Dainichi Nyorai was trying to encourage me – a huge symbol of the power of quiet – letting me know that all I really had to do in the meanwhile was climb up to the sixth floor and spend time in his presence until I could find my own meditation teacher years later. This past Monday night, my neighbor Steve Hart and I celebrated our one-year anniversary of hosting FREE meditation in my studio every Monday night at 7:30. If you haven’t already done so, you are welcome to join us – just show up a little before 7:30 p.m. as we ring the bell on the half hour. Steve had taught Zen meditation for 13 years prior to leading us in my studio. The shift to meditating at my studio has been a blessing to both Steve and I as neither of us have to drive anywhere to sit with a group. I set up the meditation pillows, turn on the hot water for green tea and gather the jar of chocolate that we share after meditating. Then I unlock the door. Steve just walks across the little park that separates our houses and brings his solemn energy to still the minds of all who enter. I still adore the Dainichi Nyorai, the supreme Buddha of Mahayana Buddhism as taught by the Shingon sect, which represents the transcendent Buddha from whom all other buddhas and all aspects of the universe emanate. 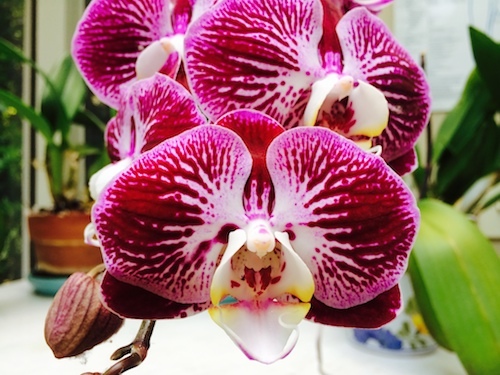 Instead of the Buddha in my studio, we enjoy the peace of my orchids. In total silence, we feel connected to all who sit with us.